Super Evil Megacorp’s mobile MOBA has been a big success on iOS, with some 1.5 million active users frantically touching turrets each month. Today the game officially launches on Android. Welcome, fresh meat. Vainglory made its debut during Apple’s iPhone 6 press conference last year, a showcase for iOS’s Metal graphics API. It’s a very pretty mobile take on the MOBA, with only a single lane and a jungle for each three-player team to contend with. Matches are relatively fast (under 20 minutes) and a a hell of a lot of fun when I win. I’ve been playing on and off since the iPad launch of the game, but since then I’ve switched from iPhone to a Samsung Galaxy S6 Edge—on which the game client is downloading as I type this. I’ve already grabbed the game for my Shield tablet, and it runs great. The influx of Android players will be playing toe-to-toe with the established iOS community, with progress and purchases tied to accounts rather than devices. For the big launch Super Evil has implemented casual and ranked queues, the latter behind a wall of various requirements to ensure newbie Android players get some experience under their belts before attempting to go pro. 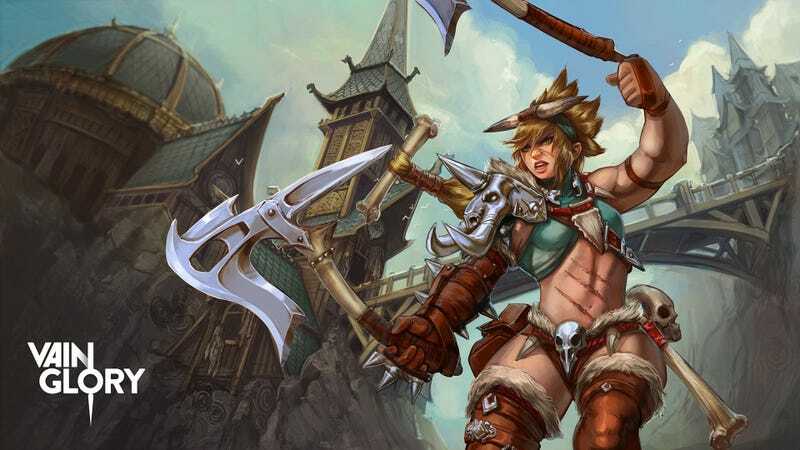 The launch also sees the debut of a new hero, the deadly barbarian Rona, who is living proof that some ladies don’t care if their midriff is exposed. Super Evil Megacorp has also partnered with Korea’s OnGameNet to develop an eight camera, 4K resolution desktop spectator client for use in future esports events. It should be incredibly lovely. There’s a 24-hour live launch party for Vainglory kicking off at 5 p.m. Eastern today, so if you’d like to see what’s going on with mobile’s premiere MOBA, go stare at Twitch for awhile.